I have been an atheist for years. I was in high school when I discovered that I no longer believed in the Christian God. Now I am almost finished university. For years the religious world seemed to be one that wasn’t open to me. It was a foreign world that I only braved when my family made me. It is awkward being surrounded by people who believe something that you do not. I didn’t like feeling out of place, so I avoided it. However, lately I have found myself entering the interfaith sphere more. I volunteer at the interfaith center at my university, and I actually went to an interfaith conference over the summer. It has been a great experience for me. My personal beliefs haven’t been affected, so I still feel that awkward sense of “these people share something that I do not,” but I have grown to understand people that were once very foreign to me. I have made new friends and have developed a sense of respect for people who do not share my beliefs. I think that it has been a wonderful experience for me. I also want to encourage others to make an attempt at understanding people who do not share their personal beliefs. My name is Hesse. I am a 24 year old university student attending the University of Calgary. I am writing you in regards to your article “Don’t be sads, it’s Christmas.” I am writing you because I am the president of the Freethinkers club at the university as well as the student lead of the Faith and Spirituality Center’s student team (FASST). I am also a committed atheist. At least I assume I fit into your definition as a committed atheist. I must admit, I’m not entirely sure what you mean by “committed.” I am not writing to convince you that atheism is right. I don’t care what you believe. And I am not writing to attack Christmas. I, like many Canadians, enjoy the Christmas holiday. I am merely writing to discuss some of the problems that I found in your article. I hope that you read my letter and I hope that it gets you thinking about some of the assumptions that you have made. In your article, you wrote “It’s an atheist’s nightmare, Christmas coming just a couple of weeks after Pope Francis was named Time’s Man of the Year.” I don’t quite understand where you are going with that comment. First off, I don’t really care who Time names as person of the year. It’s a magazine. And they have named plenty of people “person of the year,” religious or not. It really has no effect on me. Nor does it affect anybody else that I know. Second, Christmas comes every December 25. We were expecting it to come December 25 this year as well. Frankly, I like Christmas. It gives me a chance to take a break from school and work. It is my chance to relax and spend time with family and friends. That’s what Christmas is all about for most atheists. It’s also what Christmas is all about for my Catholic family. I never even heard the phrase “Jesus is the reason for the season” until I was an adult. Christmas is a wonderful holiday, and it is for everybody. If you want to keep it religious, fine. But you cannot force your religion on anybody, nor can you force everybody to accept Christmas as being strictly Christian. We all get to celebrate and we all get to do so in our own way. You went on to say “OK, let me qualify that — one of the most unhappy, lugubrious and neurotic. I’d forgotten feminists and socialists” as a description of atheists. I guess two out of five isn’t bad. Well, four. Unhappy and lugubrious mean the same thing. I am happy to admit that I am in fact both a feminist and a socialist. I believe that I deserve all of the same rights as you despite my femaleness. Don’t you? I also fully intend to vote for the NDP in the coming election. I am hoping that more people realise the problems with Harper’s Conservative government and vote Liberal or NDP. I am not, however, unhappy or neurotic. And I’m pretty sure that you don’t get to determine another person’s mental state without their direction. Unless you happen to be a certified Psychologist. You seem to be quite confused by atheism and what atheists believe. 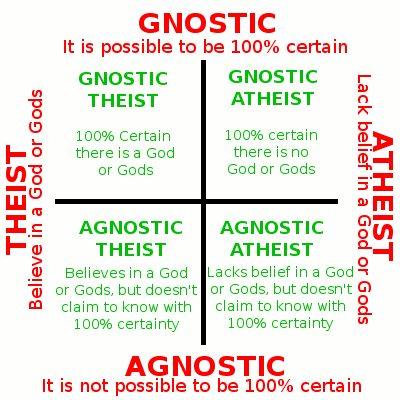 To clarify some of the misconceptions which your early comment suggests that you hold; atheists are not atheists because we are angry at god or want to sin. We are atheists because we happen to not believe in any gods. You go on to show your lack of understanding of what atheism means by saying “I suppose that if you are convinced the world is a hateful place and everybody is against you, it must seem rather dark.” I don’t believe that the world is dark and hateful. I just don’t believe that it was created specifically for people. I do happen to believe that the world is far better than it was in the past. We have clean hospitals with medicine that have drastically improved our lives. Originally hospitals were a place where people went to die. We also have an abundance of food to eat and amazing technology at our finger tips. Life in general is far more pleasurable and relaxing than it has ever been. Yes, there are issues in the world, and I do believe that it is our job to change these issues. But who exactly thinks that the world is nothing but sunshine and daisies? Most Christians don’t seem to, despite your saying “Christians, on the other hand, assume the opposite, and are convinced the world is full of light.” I’m not saying that Christians think that the world is a bad place, but some do. Some are convinced that the end times are near. Some think that the world deserves to burn because we allow gay marriage. Some are more than willing to abuse people who are immigrants, or non-Christians, or who they perceive as living sinful lifestyles. Those people don’t seem to think that the “world is full of light.” They see evil everywhere and are quite fearful. As I said in the beginning, I hope this letter allows you to rethink some of your perceptions about atheists. I look forward to hearing back from you. It is quite common for people to assume that atheists are angry and hate Christmas. I don’t understand this thought process. I love holidays. I love spending time with my loved ones. And I enjoy being able to take a break from the hassles of life. What I have a problem with is people trying to force their beliefs on others. If we all just accepted that holidays are for everybody and we are all free to celebrate how we wish, then we will all get along a lot better.